I got another lens from a junk bin in a camera store. This one is a canon f 1.4, 35-80mm zoom. It has an auto focus motor that makes a sound a bit like you might hear if you put a blender in a blender, but the auto focus still works. The bits that don't work so well, are the lenses. The problem is mould inside the lens. Not uprising for a 500 Yen lens sitting in the junk bin of a camera store in the country that invented humidity. That's a ridiculously close up shot of the mould. I don't have any way of doing macro shots with my new camera, so I had to improvise. I took the shot of the mould with this home made bit of kit. The blue lens cloth is there to keep the light out of the improvised macro lens, because the small length of toilet roll acting as an extension tube isn't light tight. The lens attached (that's a generous description) to the camera is actually on backwards, and is resting against the other end of the toilet roll tube. The lens resting on the red kitchen scrubber is the new one with the mould garden inside. The torch is a torch. The torch is there because the camera's lens has the aperture set as small as it will go (f36) to try to get at least some of the mould in focus. I didn't really achieve that. The exposures were around 30 seconds long (many minutes without the torch), and other people were working in the house at the time. My desk is a wobbly kitchen table top heavy with old CRT computer monitors, and all the other junk I like to keep at hand. As as a result it amplifies any movement from people, traffic, and the fridge and freezer compressors. If you put a glass of water on a desk like mine and look at the reflection, you will see the reflected image dance all over the place. Normally it isn't a problem, because the camera and lens would both move at the same time, but with this contraption, there was nothing of substance connecting the lens and the camera. The lens has mould in it. 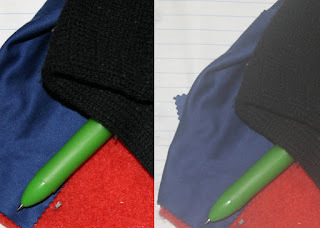 The image on the left was taken with the canon 18-55mm lens that came with the camera. The image on the right is taken with the mouldy 35-80mm lens. The camera was set to the same settings for both shots. Mould is not a friend of the lens. The point of all this, is to point out that I wont be taking an angle grinder to my lens in some future post without reason. Actually I'll try to open it up and clean it, but there is a fair chance it's bits of glass are coated in a very delicate plastic coating, called coating. If that's the case the mould may have become a permanent fixture by etching it's way into the coated bits. The mould appears to be on only one element, so I might be able to salvage some other bits and make a proper, mould-free macro lens. 120 Things in 20 years warns that when I say "proper" I mean the improvised macro lens might employ slightly fewer toilet paper tubes, and where they are unavoidable, they might be made a bit less wobbly and light leaky.